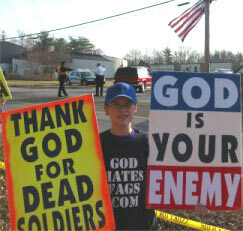 An update to our “God Hates Dead Soldiers” post. The family of dead Marine Lance Cpl. Matthew Snyder has been ordered to pay $16,510 in legal fees to Fred Phelps. Hmmmm… not so sure I’d want Bill O’Reilly’s monied interests on my side. Posted by Kim in Death + the Law, Death Ethics and tagged free speech, protests, soldiers, Westboro Baptist Church. Bookmark the permalink.